I've never used dry shampoos before so I was interested to see how this would perform. Typically I tend to use texturising and surf sprays, the downside being that they tend to make my hair dirtier quicker. Drymatic is designed to take the hassle out of dry shampoos. Described as a style extender this will leave your hair looking glossier and cleaner. I spritz this into the roots and then work it through my hair with my fingers and a tangle teezer so that it really gets worked in. You aren't left with a white cast which is awesome if you have dark hair like me. It lasts pretty well throughout the day but you may need to top this up after four or so hours. Thankfully, there's a handy mini size for that. I've had people complimenting my glossy hair when I've used Drymatic on third day hair. If that doesn't show that it's doing its job then I don't know what will. All in all I've been impressed with my initial venture down the dry shampoo rabbit hole. The mini size and full size of Drymatic are both available from Sebastian Pro retailers now. 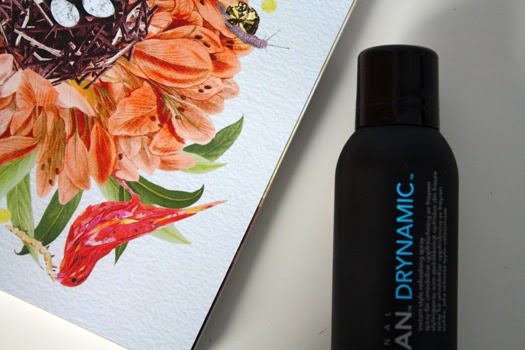 If you're looking for a dry shampoo that is convenient and user-friendly then you should pick this one up. -Have you used dry shampoos before? Which do you love? **Let's be honest, I find hair washing tedious. Does anyone not? *I hope you're all having a fabulous week! My week's been a bit quieter which is in part thanks to the hideous weather we're having. As I write this I can hear doors slamming in another part of our house and the wind howling away outside. Make it stop! I've also been working away on iMovie the last few days and I'm determined to get my video finished today. It'll either be up tonight or tomorrow so keep an eye out! I'm having a total mind blank about what else has been going on. There has been stuff happening but it's 9am and I am yet to have a coffee so yeah. Go figure..Have a great Wednesday x.
I live for Batiste dry shampoo for Brunettes. The normal one is fine too but I prefer to not have the risk of that powdery colour drawing attention to my regrowth (so glamourous). I love Batiste and they have a great range of scents and ones for brunettes etc as well. Do you know how much this one is?